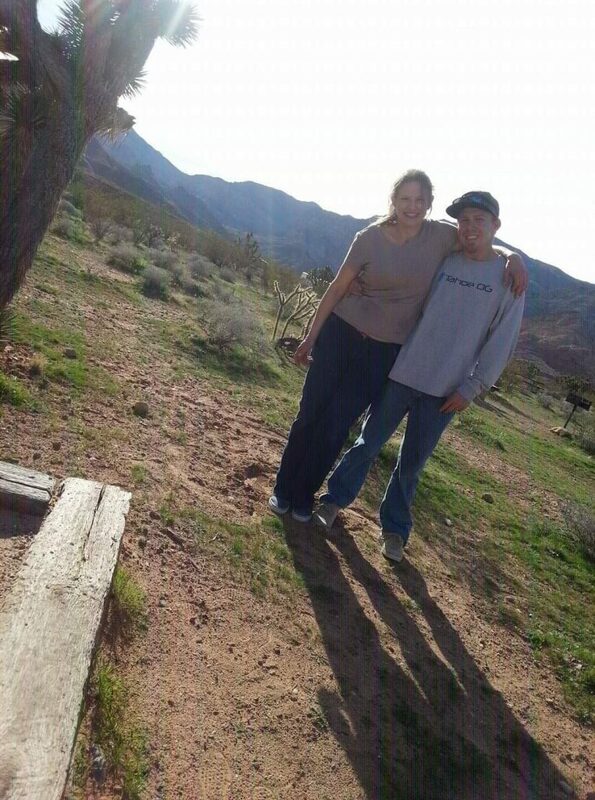 ST. GEORGE — Randall Solomon was a social, adventurous young man who enjoyed spending his time doing outdoor activities with friends, pursuing a career and spending time with his kids and girlfriend before a rare and devastating autoimmune disorder took it all away from him. In May 2012, Solomon was diagnosed with acute disseminated encephalomyeliti, or ADEM, an extremely rare autoimmune disease in which the body’s immune system mistakenly attacks its own brain tissue, according to the Transverse Myelitis Association. The disease is in the same family as multiple sclerosis, and the exact cause of it is unknown. It is more common in children than adults and is thought to affect only one in every 125,000 to 250,000 people each year, according to the National Multiple Sclerosis Society. Solomon was 29 years old when he contracted the disease. An MRI revealed brain swelling and 17 brain lesions, one the size of a silver dollar. 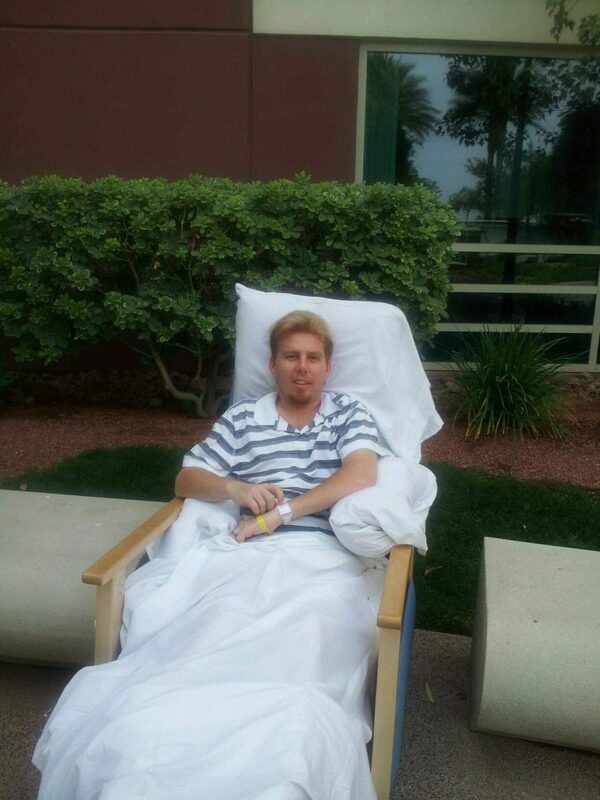 He underwent a brain biopsy before being put into an induced coma for the next three months. When he woke up, he found that the disease had severely damaged parts of his brain and robbed him of his speech, mobility and ability to eat and perform basic functions. “I woke up penniless, homeless and unable to walk or talk or any of that,” Solomon said. Solomon spent six months in the hospital, undergoing hourly, painful, body seizing and multiple surgeries. After being released from the hospital, Solomon spent another six months in a rehab facility learning how to walk and talk again and rebuilding muscle after his three-month coma brought him down to 4 percent muscle mass. As if his body attacking itself wasn’t enough, Solomon found himself with no job, no home, no girlfriend and $3 million in medical bills. He was unable to participate in his usual active, outdoor lifestyle, and many of his friends stopped talking to him. “I never even imagined before this that I would ever suffer such a huge loss, and not just health,” Solomon said. He stayed with his mom for four months. Suffering from anxiety and panic attacks and praying to die, he finally decided that he needed a change from the busy Las Vegas area and moved to Junction, Utah. In 2016, Solomon met his fiance Shana Shields, who encouraged him to go with her to Marysvale Baptist Church where he found God and a supportive community. Finding new purpose, Solomon began the process of getting off the opioids and anxiety medication that he was taking. He began walking along the Piute Reservoir for exercise and to practice walking on uneven ground. As he would walk, he would come across unique and interesting rocks and logs and take them back to his shed. Soon, he had large piles of them that he didn’t know what to do with. “I just felt this urge to just make something beautiful with the wood I had there I guess, and it just kind of all fell into place,” Solomon said. 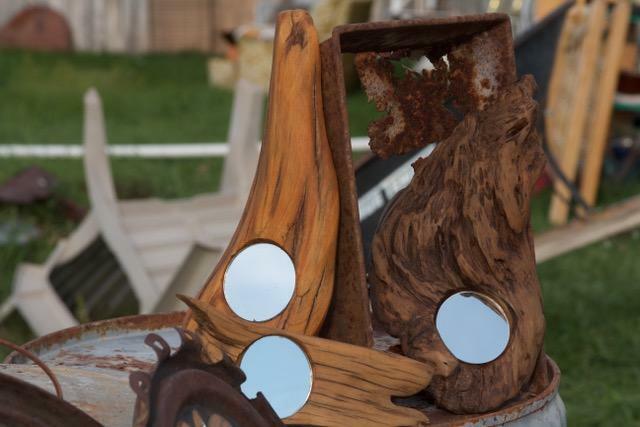 He slowly acquired the tools needed and began making art using the driftwood he found in the reservoir and rusty antiques he found at the old Junction dump. 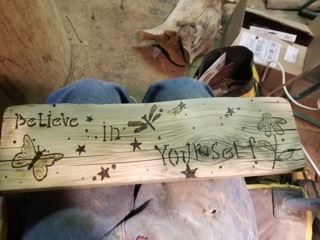 He makes chimes, mirrors, signs and sculptures to sell and donate to his church and other local causes and businesses. Solomon recently received three grand champion awards and two reserve awards for woodworking, wood carving and geology from Utah State University. His art is displayed at the Big Rock Candy Mountain restaurant in Junction, and other various locations throughout town as well as on his new website. Solomon still struggles with the effects of ADEM. The disease having damaged his balance, he walks with a cane to keep from falling. just gotta do the best we can with the cards we’re dealt, ya know. We all just need to keep our chin up and help each other. Donate what you can when you can and your life will be blessed. Pay it foward without any thought of what’s in it for you. It’s worked for me.